HSD™ Detectors | Senkox Technologies Inc.
Senkox HSD™ Linear Hot Spot Detectors are advanced multi-functional detectors that provide early detection of fire or conditions of overheating to protected areas or equipment. Senkox HSD™ Linear Hot Spot Detectors can detect the real-time temperature, position and size of hot spots along the Senkox HSD™ Linear Heat Sensor cable. They can also provide the rate of temperature increase, and the temperature difference between hot spots and the ambient temperature. The detectors have various types of output interfaces, such as relay outputs, analog output (4~20 mA or 0~5V), and serial communication port (RS485 or RS232, Modbus/RTU protocol). The detector consists of two major components: An HSD™ Linear Heat Sensor cable and an HSD™ DAQ Module. Linear sensing technology provides line coverage with superior sensitivity. 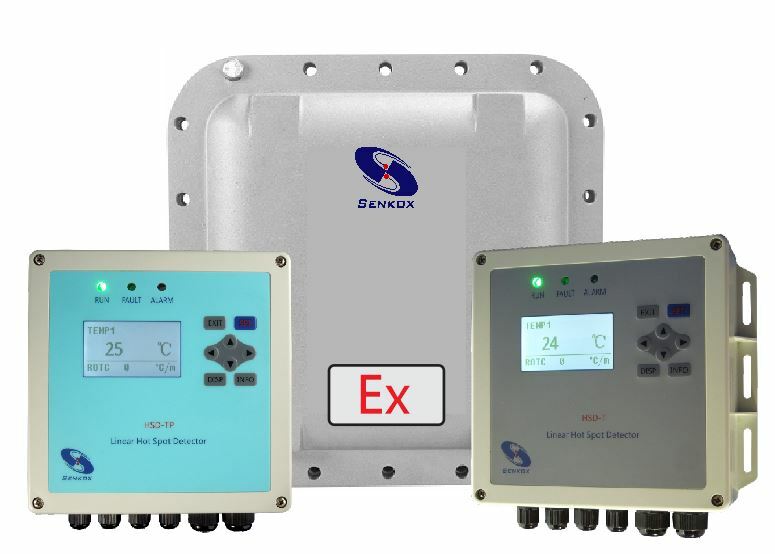 Real-time temperature measurement of temperatures ranging from -40°C to 600°C. Detect early overheating temperature from -40°C to 80°C. Rate of temperature change (ROTC) detection. Pre-alarm and alarm set point are software adjustable from -40°C to 600°C. Full supervision for trouble alarms, include short and open circuit. Rate of temperature change (ROTC) alarm. Innovation sensor materials and process provide stable function and uniform sensitivity. Sensors withstand high abrasion, high temperature and high pressure. No damage to sensors after alarm, re-usable. Temperature difference between hot spot and ambient temperature. Simple system layout, plug and play installation. Modular system structure, easy to maintenance and replace. Can be used as field alarm system. Can be connected to user existing DCS or monitoring system. The Senkox HSD™ Linear Heat Sensor continuously detects hot spots along the sensor cable. The hot spot signals generated from the Senkox HSD™ Linear Heat Sensor cables are acquired and processed by the DAQ Module. The processed data is output through the analog output channels (4-20 mA or 0-5V) or the serial communication port (RS485 or RS232, Modbus/RTU protocol) to the user DCS system or fire alarm system.